This thick, custardy baked apple pancake takes me straight back to my childhood. Dust it with powdered sugar for a sweet finishing touch & dig in! My sister and I used to beg my mom for things like Fruity Pebbles and Frosted Flakes. She didn’t cave often, but I remember the few times she did… she’d sigh and say, “If I buy this, are you really going to eat it this time?” We’d smile and nod, excited to be taking home the same colorful boxes our friends had. We’d each eat maybe one bowl full. Then up in the pantry it would go… to collect dust and then ultimately get tossed in the next pantry clean-out. The smiling kids on Saturday morning commercials would convince us to beg again… and we’d try SO hard to like the stuff. But sugary soggy flakes and blue milk were not for us. Especially when homemade muffins, pancakes, eggs, doughnuts, and this German(ish) apple pancake were all part of our regular breakfast rotation. This was a staple of our childhood, and my mom still makes it every time she visits. Apples, brown sugar, and cinnamon get softened in a pan with butter, and an egg mixture gets poured on top. The thin egg layer and pillowy apples create more of a custard-like texture than a traditional doughy pancake. Bake until it puffs up and serve hot slices right out of the pan. For more brunch ideas, try these vegan banana pancakes, this shakshuka, or this frittata! 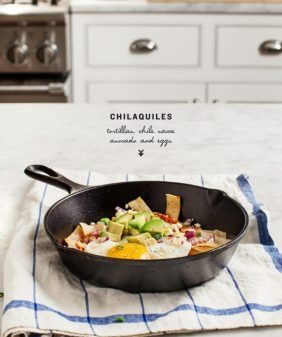 (The photo above is of a 5-inch mini skillet, but the recipe makes enough to fill approx a 12 or 13-inch skillet. Use either a seasoned cast iron skillet, or a non-stick pan). 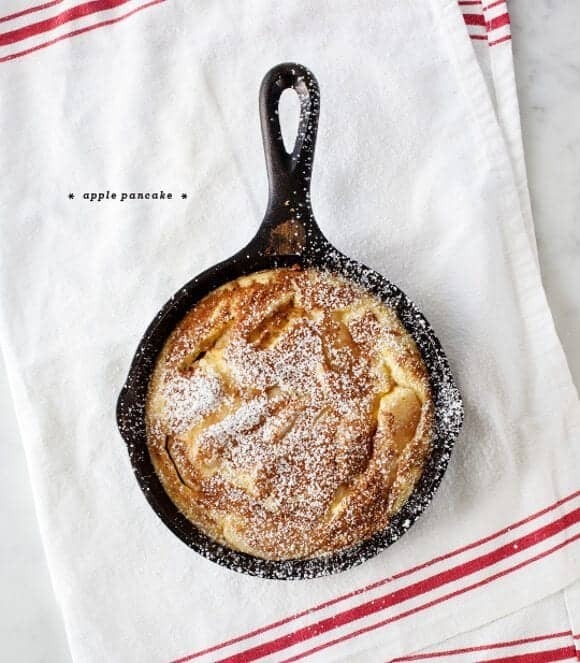 This heavenly apple pancake is perfect for a weekend brunch. Unlike a typical pancake, it has a rich, custardy texture that's delicious with powdered sugar on top. Combine brown sugar and cinnamon. Mix together flour and baking powder and stir it into the egg/milk mixture. In a skillet, heat butter, add the apple slices and 1 tablespoon of the brown sugar mixture and cook, stirring, until soft. About 5 minutes. Pour the batter over the apples and sprinkle the remaining brown sugar on top. Bake until it puffs up, about 18-20 minutes. Dust with a little powdered sugar. *note: Spelt flour is not gluten-free. Mmm what a fabulous recipe! You had me at pancake. I’m a sucker for all things breakfast. Adding this to the “to-make” list. Looks delicious!! Can’t wait to try it. This sounds perfect – I love the combination of fluffy pancake and sweet apples. This looks delightful! Do you have any tips for those of us who don’t own a cast iron skillet? The cast iron skillet isn’t necessary, a non-stick pan works too. I used a non-stick dutch oven pan.It worked great! Yum! My husband loved those sugary cereals. I was never allowed to have them, we were strictly a Cheerios and Chex family. I never really craved them but I definitley felt like I missed out on the phenomenon. My dad was the expert pancake maker in our house. Blueberry was his specialty. I love making pancakes on the weekend. I cannot wait to try this big guy! i have been working on a vegan and gluten free skillet cake. however, your pancake recipe sounds amazing as well! You were lucky kids having those sort of breakfasts in rotation!!! Love making baked pancakes sans the eggs though as I’m vegan. Yours looks gorgeous as always! I am going to make this Sunday morning. I can’t wait! Once again, I love how simple yet elegant your recipes are. And of course, I love that they use whole natural foods and whole meal flours. So awesome! I look forward to each new post you have every week. Thanks! Since going wheat and dairy free, I have been looking for a recipe for an apple pancake to replace the one we used to love. This is it! I’m so excited to try this – my husband will be so excited! Hi Yvonne, I hear you… I’m always looking for ways to replace dairy, hope you like it! Yum. This looks so perfect. I have a couple of Bosc pears peaking out of my fruit bowl that would be lovely paired up with apples in this. Saturday is sounding better and better the more I think about this pancake! thanks Sara! Sounds delicious with pears… hope you like! I love the addition of apples to this German pancake recipe. I also love that it is made in the skillet in the oven. such a cute memory, what a testament to your mom! This looks so pretty. 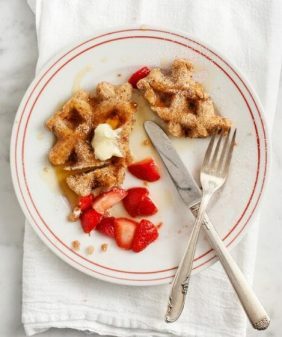 We are into waffles lately, but this looks like something that could feed a few more in a larger skillet. Looks great, my dear! I certainly wouldn’t be eating crazy cereal, when I can be having pancakes like this one! Looks fabulous. I am coming over for breakfast! Wow! If this had been in my breakfast routine growing up, life would have been MUCH different. I.e. my breakfast fixation probably would have begun long before age 19! 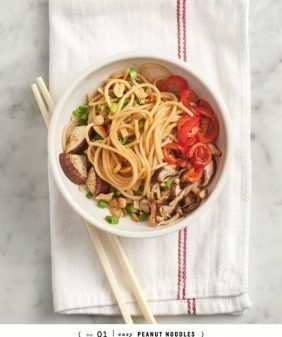 I’m really curious to see if someone will somehow come up with an egg-less version of this someday (not sure how that would work), but in the meantime, this looks absolutely delicious and I can’t wait to try it out. thanks 🙂 Yep, this is totally more egg than “pancake” (especially this recipe – sometimes we don’t even use the flour). Hello!?! This is not normal, it looks INCREDIBLE! YUM! oh I hope you like both! My family had a tradition of making these except without the apples. We ate ours with blueberries cooked on the stove until they were runny and syrupy. My favorite thing to eat ever. My brothers and I were also never allowed the colourful sugary cereals, they were a very occasional treat. I’m in Australia so Weet Bix was our regular cereal! Mum and dad had a great rotation of pancakes, french toast, eggs many ways on Sundays for us. This looks delicious. I pin so many of your recipes and am slowly making my way through them. Next on my list is the chocolate cupcakes with avocado – the combination intrigues me and I simply must try it. Your photos are delightful! Is there a way to heat up this properly for later? I don’t think this one would be as good later as it is straight out of the oven. I imagine it would get pretty flat and soggy. Can’t go wrong with apples & pancakes, yum!! Awe, this reminds of a recipe my mom always used to make for us kid. So delicious. Apples and cinnamon are really the best combination ever. Gorgeous photos! I love how all of your photos are always so bright and cheerful. Beautiful pictures! And, this particular recipe looks divine! I can’t wait to try it. Thank you for the inspiration. I actually enjoy eating the leftovers cold for breakfast from the fridge – the flavours as just as good if not better!!! I’m so glad you like it as much as we do! 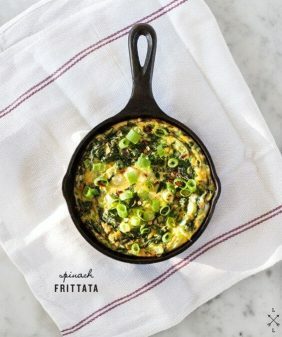 I am vegan what would you use in this recipe for the three eggs, please? This one is really all about the eggs, I don’t think I can offer a direct substitution… the whole recipe would really have to be re-thought. But stay tuned, I have some great vegan pancake and french toast recipes coming up! This looks delicious. What kind of apples do you recommend using? hmm… my mom usually gets whatever is on sale so I’m sure I’ve eaten this with many types :). I think it’s pretty flexible, I personally would choose ones that are more sweet than tart. My mom would make this for breakfast all the time when I was growing up. The only thing we would do different was squeeze fresh lemon juice on the top right before eating. Thanks for sharing! I have been looking for a recipe to make apple pancakes for years since my mom can’t remember how she made hers. As for eating it cold; it tastes almost as good just a little squishy. How do you know whether your skillet is able to be put in oven ? Most skillets can be put in the oven (especially cast iron). This was amazing!!! Slicing the apples on my mandolin make that one step easy, but I did have an “oops.” I neglected to peel the apples. Nonetheless, it turned out delicious! Thanks for sharing. It was quick, easy, and amazing. And we never had the “sugary” cereals growing up either. My son begs and begs for them, but even though “eating healthy” has never been one of my strengths, I just can’t see starting the morning with sugar and food coloring! Yeah, same here. I think I may have had too much apple and not enough puff. 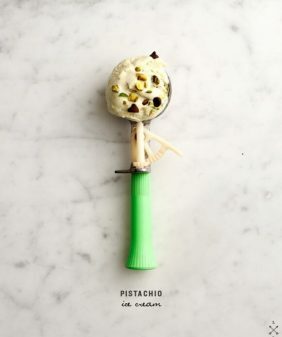 This recipe looks so beautiful. Just a question, not sure if I’m just overlooking it, but where does the other one tbl of butter go? thanks! The butter isn’t divided – it cooks with the apples. It’s the brown sugar is divided between steps 5 & 6. Does that help? I just tried out this recipe and it was delicious! I loved the egginess of it – was not expecting that haha. I wanted to let you know I featured the link to your recipe on my website. Hi! I have a quick question. Could I make this without eggs? Or do you know of any kind of substitute? Thanks! Hi Samantha – this one is really all about the eggs so I wouldn’t recommend substituting them (it’s more custard-y than it is a traditional fluffy pancake). I’m working on some vegan pancake recipes though – stay tuned! What size is the skillet? I made this today with disappointing results. Followed the recipe to a T, but mine came out like scrambled eggs with apple slices. It was so bad we had to throw the whole thing out. I’m wondering if the 2 TBS of flour could possibly be a typo? I’ve looked into other recipes, and they call for at least 1/2 cup of flour, so I’m wondering if that could be the issue. Would love to know because I would love to make this again – it looked so good! Hi Jaclyn, I’m sorry you didn’t like this one. It is definitely more eggy like a German apple pancake (not like regular pancakes at all). 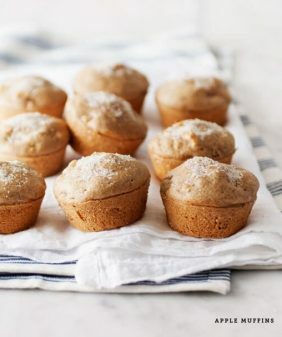 It’s a bit different but once the powdered sugar goes on, we really love it this way. 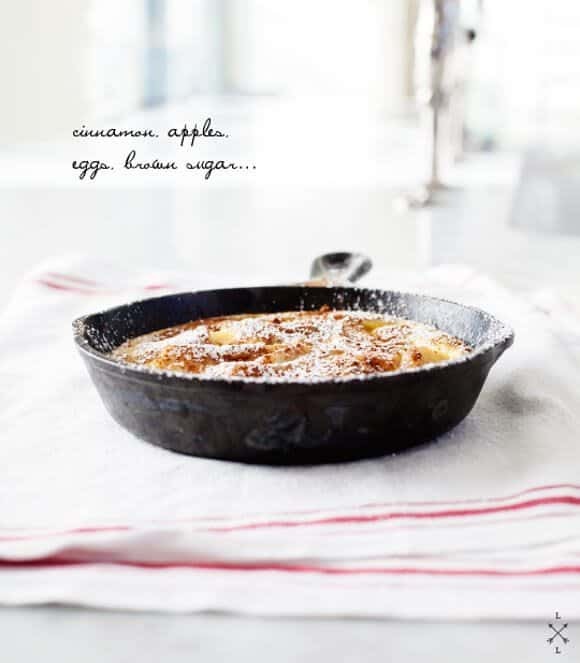 We have a dutch baby recipe in the cookbook that is less eggy and more doughy – I think it uses 1/2 cup of flour – I don’t have it handy right now but I can send it to you later if you like.